Some weeks ago, I was asked by Makeblock if I wanted to review a kit that they are putting on Kickstarter? I guess they asked my since I've written about some of my other Makeblock experiences and use it for most of my robotic projects, and of course I wouldn't mind testing out something new. But - I got an idea - who better to test it than my 10 year old daughter Vera? They liked the idea and sent the kit off. Disclaimer: the kit was given to me, but because of Norwegian customs regulations it is impossible to get anything "for review purposes". Due to that, I had to pay both handling fees & vat of the theoretical price, making it a fairly expensive project, but hey - I get some quality time with my daughter & she get's to make another robot! The kit came in one of those nice, blue Makeblock boxes that I have a few of already. As soon as the courier arrived with the package, my daughter started asking what day we were building? Due to family plans, the first day of building took a few weeks to work out. The kit is quite impressive when you lay out all the parts - stepper motors, beams, wheels, nuts-n-bolts, electronics, sensors…. It's a really solid kit and it is the foundation of no less than 4 different robots. It's quite an ingenius little kit in that it contains all the kinds of drawing robots that you'd want to build - a pantograph arm-style robot (mScara), a Polargraph wall-drawing robot (mSpider), an egg-bot for drawing on round objects (mEggBot) & a PenBot (mCar, same kind as the NITH Penbot I designed some years back). Vera very soon found out that she wanted to build the mScara robot first! The day arrived and Vera thoroughly liked hanging at Bitraf (my local hackerspace) a whole day while building! The deal was - she would test the kit and I would sit next to her working on something else. If she got a problem, she would ask me for advice. Turns out, she needed a lot of help. The reason? We only had a video of the robot being dis-assembled and no instructions on how to build it. I contacted Makeblock and they said that unfortunately that wasn't finished yet but we could get it very soon. Oh well. It was after all Saturday so she had candies while she mounted the electronics and peeled the foil off the plastic parts. We had planned another build-day and this was after all a Beta test, so we could not expect it all to go perfectly smooth. 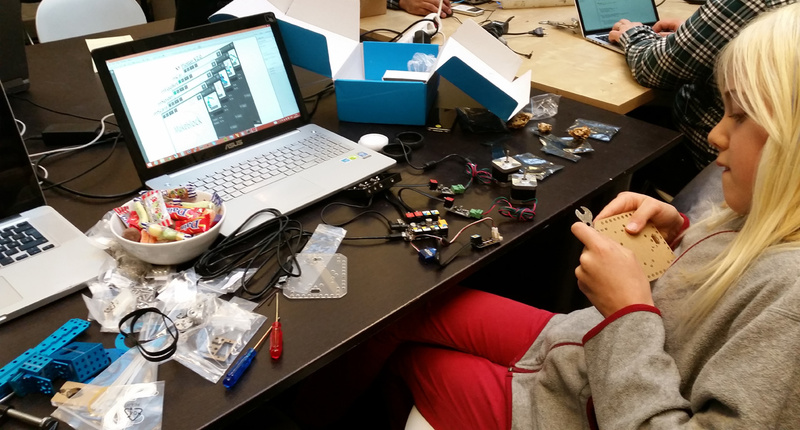 About two weeks later, we had another build-day at the hackerspace and this time we had instructions! This day, Vera kept building and only asked me twice for advice so the instructions were rather good! The only things she asked about where "Do I use this length or this length screws" and other simple things. At the end of the day, we got the robot working and she chould start drawing! We'll keep exploring the kit in the weeks to come, but we really like it already. Vera's reaction to opening it was that of a kid opening a massive box of candies and the software makes it a breeze to change between robot configurations. Vera did not think it was difficult to build the robot at all. She has a little LEGO experience that I think came in handy, but I think this kit would work for all kids that enjoys tinkering and building. My concern wih this project builder is cost. You touched on it in your disclaimer. I feel it is very important to find a way to drop the price of the kits and Add-ons. Schools have budgets and there are only so many rich kids out there. I’ve been writing a “how to fix anything” type paperback book and have been looking for some kit type hardware to include with it or otherwise make available. Something to tag along and demonstrate the “what drives/powers what” principle. Like this or Arduino that a student can follow electrical and mechanical processes to identify problem areas. I like Arduino because the software is there as well and realatively easy to figure out. Arduino is also cheaper with its open source platform. @Todd I don’t agree regarding price. If you want a cheap kit, you can buy a cheap kit elsewhere. The reason I like Makeblock is that it does not have that cheap and flimsy feeling that other solutions do. It’s more like LEGO - it’s built to last? Regarding teaching - I wrote a bit about that here: http://flashgamer.com/blog/comments/teaching-with-robots Same thing - cheap kits won’t last another year, so in the end they’re not cheap. Although I’m not necessarily a fan of digital drawing, gadgets like mDrawBot could really enhance the way kids draw on paper, by connecting the dots between tech and real life. I love the concept and I also love the fact that these machines are so small but yet so effective.